Teachers and schools across the country work to transform education by embracing innovation. It is not easy, nor simple work, but innovations like blended learning are a pathway forward to meeting the needs of all learners. TLA’s initial mission was to address the major barriers school districts face when implementing blended and personalized learning. We quickly learned that effective communications could help make or break a blended learning initiative. Our goal was to build the communications expertise and capacity of district leaders to ensure their innovations in the classroom would be successful. TLA launched in late 2012, with an initial focus on identifying and addressing the major barriers districts faced when adopting blended learning. It quickly became evident that poor communication was one such barrier, leading to unmanageable expectations, confusion, and opposition. Strong two-way communication, however, was an enabler; building engagement, trust and credibility. In order to better understand the issue, in 2013 TLA interviewed communications and blended learning experts, as well as education leaders and school districts, and confirmed that many of our nation’s school districts lacked sufficient communications expertise and capacity. As more schools shifted to blended learning, district leaders were recognizing the need for communications assistance to build understanding and support for their implementation efforts. We learned that, while there was ample guidance around general communications planning, there were no tools or supports for effective communications for blended learning. Throughout 2014, TLA worked closely with three school districts that were implementing blended learning. These districts, in Rhode Island, Colorado, and Ohio, provided an excellent testing ground for TLA’s initial thinking about the types of communication support that would be most valuable. We were also able to see first-hand what types of messages resonated with key stakeholders and who the most effective messengers were, and to test the value of communications planning templates and timelines. TLA was also working with several state education leaders at this time, developing frameworks around how states could accelerate the implementation of blended learning. For example, we worked with the Rhode Island Department of Education on its blended learning outreach and quarterly newsletters. We developed deep relationships with the Colorado Department of Education as it worked to catalyze community engagement and support for student-centered learning. This work demonstrated a growing realization at the state level about the importance of effective communications when innovating in schools. In July of that year, TLA released a second, more comprehensive communications planning tool: Communications for Blended Learning: Step by Step Guide. This resource provided school leaders with an actionable roadmap for developing a communications plan for their blended learning initiatives and included helpful tips and examples from other communications experts. Throughout the rest of the year, and into 2016, TLA partnered with key blended learning service providers to either offer or embed the communications guidelines in their work. For example, the Friday Institute included our communications recommendations in their cohort-based Principal training programs. Relay Graduate School of Education included our work in their teacher training modules for blended learning and major blended learning initiatives like Raise Your Hand Texas include TLA’s communications guides in workshops and on their websites. In February 2016, TLA’s communications work with the Colorado Department of Education culminated in the release of the Community Collaboration for School Innovation toolkit. This guide helped school districts understand the importance of community collaboration as a key to innovation and included case studies from Colorado school districts, video tutorials, and templates. Throughout 2016, school districts, agencies, organizations, and professional service providers increasingly understood and appreciated the role of communications in successfully implementing blended and personalized learning. National organizations like Future Ready added TLA’s communications resources to its dashboard and highlighted the work through webinars and workshops. Major education innovation conferences, like SXSWedu, iNACOL, ISTE, COSN, and others, which had few or no sessions around communications in 2013, now offered numerous sessions around communications planning, messaging, social media, and other topics. Even smaller, regional convenings, like Colorado’s Conference on Blended and Online learning or CUE’s Northern California Blended and Online Learning Symposium included sessions around communications. As education leaders increasingly understood the critical importance of effective communications, it became clear that they wanted real-world examples of how other districts were tackling the issues. In March 2017, TLA partnered with Education Elements to refresh our communications planning guide and include numerous case-studies from districts across the country. 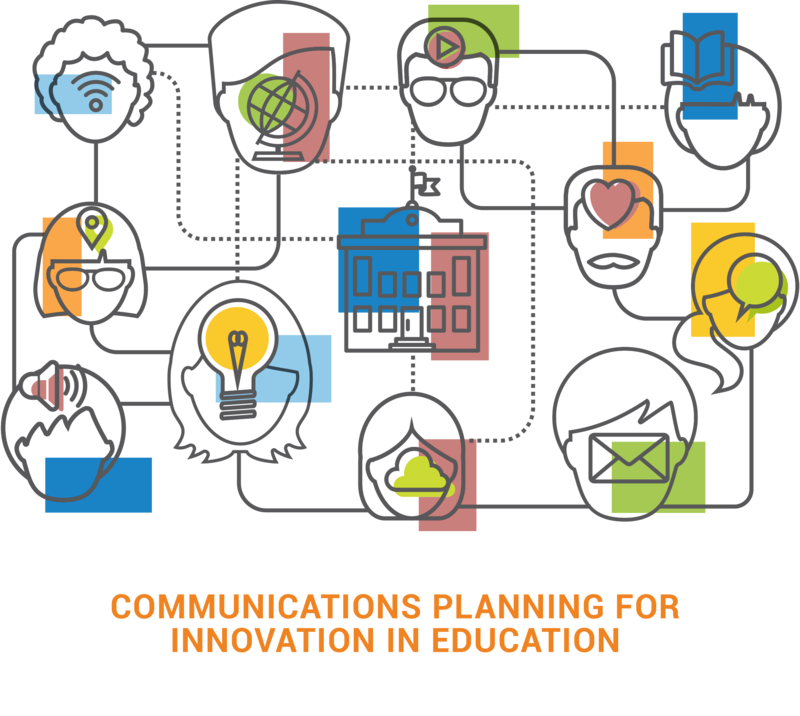 Communications Planning for Innovation in Education streamlines the communications planning process, offers profiles of districts that have done great communications work, and links to dozens of helpful artifacts and tools. The importance of effective communications, and the need for strategic communications planning, was not widely recognized in 2013 when TLA began its work to catalyze blended learning in schools across America. Since then, we have developed targeted guides and toolkits, conducted workshops at major conferences and online webinars, published opinion pieces and commentary in major edTech media outlets, and galvanized other organizations that work with education leaders to include communications training and capacity building. While the need for ongoing attention to communications will not dissipate, we now at least have widespread understanding of its value and the tools embedded throughout the ecosystem to help districts successfully shift to blended and personalized learning.